USES: This medication is used to treat moderate to severe acne in patients 12 years of age and older. It helps to reduce the number of pimples. 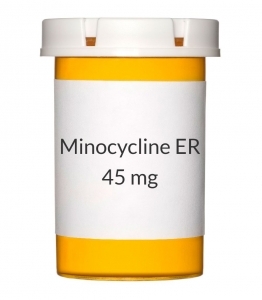 Minocycline belongs to the class of antibiotics known as tetracyclines. It works by stopping the growth of bacteria that may worsen acne. This antibiotic is approved to treat acne that is thought to be caused by a bacterial infection. It will not work for viral infections (e.g., common cold, flu). Unnecessary use or overuse of any antibiotic can lead to its decreased effectiveness. HOW TO USE: Read the Patient Information Leaflet provided by your pharmacist before you start using this medication and each time you get a refill. If you have any questions, consult your doctor or pharmacist. Take this medication by mouth with or without food, usually once daily or as directed by your doctor. Do not crush or chew extended-release tablets. Doing so can release all of the drug at once, increasing the risk of side effects. Also, do not split the tablets unless they have a score line and your doctor or pharmacist tells you to do so. Swallow the whole or split tablet without crushing or chewing. Take each dose with a full glass of water (8 ounces or 240 milliliters) unless your doctor directs you otherwise. Do not lie down for 10 minutes after taking this medication. For this reason, do not take it right before bedtime. You may take this medication with food or milk to lower the chance of irritating the esophagus and stomach unless your doctor directs you otherwise. Take this medication 2-3 hours before or after taking any medications containing magnesium, aluminum, or calcium. Some examples include antacids, quinapril, certain forms of didanosine (chewable/dispersible buffered tablets or pediatric oral solution), vitamins/minerals, and sucralfate. Follow the same instructions if you also take bismuth subsalicylate, iron, and zinc. They bind with minocycline preventing its full absorption. Dosage is based on your medical condition, weight, and response to therapy. Antibiotics work best when the amount of medicine in your body is kept at a constant level. Therefore, take this drug at evenly spaced intervals. Continue to take this medication for the prescribed length of time. Do not skip doses. Stopping the medication too early or skipping doses may allow bacteria to continue to grow and increase the risk of developing resistant bacteria that are more difficult to treat. Inform your doctor if your condition does not improve after 3 months of treatment or if it worsens. SIDE EFFECTS: Nausea, vomiting, diarrhea, lightheadedness, dizziness, unsteadiness, drowsiness, mild headache, mouth sores, or cough may occur. If any of these effects persist or worsen, notify your doctor or pharmacist promptly. Remember that your doctor has prescribed this medication because he or she has judged that the benefit to you is greater than the risk of side effects. Many people using this medication do not have serious side effects. Tell your doctor immediately if any of these unlikely but serious side effects occur: sunburn (sun sensitivity), muscle pain, difficult/painful swallowing, change in the amount of urine, pink urine, brown/gray tooth discoloration, blue/gray/brown discoloration of the skin/lips/tongue/gums, numbness/tingling of the hands/feet, unusual tiredness, stopping of menstrual periods, new signs of infection (e.g., fever, chills, persistent sore throat). Tell your doctor immediately if any of these rare but very serious side effects occur: hearing changes (e.g., ringing in the ears, decreased hearing), easy bruising/bleeding, unusual/severe headache, vision changes (e.g., blurred vision). This medication may rarely cause a severe intestinal condition (Clostridium difficile-associated diarrhea) due to a type of resistant bacteria. This condition may occur during treatment or weeks to months after treatment has stopped. Do not use anti-diarrhea products or narcotic pain medications if you have any of the following symptoms because these products may make them worse. Tell your doctor immediately if you develop: persistent diarrhea, abdominal or stomach pain/cramping, blood/mucus in your stool. Use of this medication for prolonged or repeated periods may result in oral thrush or a new vaginal yeast infection (fungal infections). Contact your doctor if you notice white patches in your mouth, a change in vaginal discharge, or other new symptoms. A very serious allergic reaction to this drug is rare. However, seek immediate medical attention if you notice any of the following symptoms of a serious allergic reaction: rash, skin lesions/sores, itching/swelling (especially of the face/tongue/throat), severe dizziness, trouble breathing, new or worsening swelling/pain in the joints, swollen glands, loss of appetite/weight loss, chest pain, fast/irregular heartbeat, severe stomach/abdominal pain, yellowing eyes/skin, dark urine. This is not a complete list of possible side effects. If you notice other effects not listed above, contact your doctor or pharmacist. In the US - Call your doctor for medical advice about side effects. You may report side effects to FDA at 1-800-FDA-1088. In Canada - Call your doctor for medical advice about side effects. You may report side effects to Health Canada at 1-866-234-2345. PRECAUTIONS: Before taking minocycline, tell your doctor or pharmacist if you are allergic to it; or to tetracycline or related drugs (e.g., doxycycline); or if you have any other allergies. This product may contain inactive ingredients, which can cause allergic reactions or other problems. Talk to your pharmacist for more details. Before using this medication, tell your doctor or pharmacist your medical history, especially of: kidney disease, liver disease, problems swallowing, esophagus problems (e.g., hiatal hernia, reflux disease-GERD), lupus. This drug may make you dizzy or drowsy. Do not drive, use machinery, or do any activity that requires alertness until you are sure you can perform such activities safely. Limit alcoholic beverages. To minimize dizziness and lightheadedness, get up slowly when rising from a sitting or lying position. This medication may make you more sensitive to the sun. Avoid prolonged sun exposure, tanning booths, and sunlamps. Use a sunscreen and wear protective clothing when outdoors. Before having surgery, tell your doctor or dentist that you are using minocycline. Caution is advised when using this drug in the elderly because they may be more sensitive to its effects. This medication should not be used in children younger than 8 years of age because it may cause permanent tooth discoloration and other problems. Tooth discoloration has also occurred in older children and young adults. Consult your doctor for more information. This medication is not recommended for use during pregnancy because of possible harm to an unborn baby. It should not be used in women or men trying to have a child. Women of child-bearing age and men should use effective birth control while taking this medication. Consult your doctor for more details. If you become pregnant or think you may be pregnant, inform your doctor immediately. This medication passes into breast milk in very small amounts. While there have been no reports of harm to nursing infants, consult your doctor before breast-feeding. DRUG INTERACTIONS: See also How to Use section. Your doctor or pharmacist may already be aware of any possible drug interactions and may be monitoring you for it. Do not start, stop, or change the dosage of any medicine before checking with them first. This drug should not be used with the following medications because very serious interactions may occur: acitretin, alitretinoin, isotretinoin, tretinoin taken by mouth. If you are currently using any of these medications listed above, tell your doctor or pharmacist before starting minocycline. Before using this medication, tell your doctor or pharmacist of all prescription and nonprescription/herbal products you may use, especially of: digoxin, live bacterial vaccines, penicillins, warfarin. Although most antibiotics probably do not affect hormonal birth control such as pills, patch, or ring, some antibiotics may decrease their effectiveness. This could cause pregnancy. Examples include rifamycins such as rifampin or rifabutin. Be sure to ask your doctor or pharmacist if you should use additional reliable birth control methods while using this antibiotic. This product can affect the results of certain lab tests. Make sure laboratory personnel and all your doctors know you use this drug. This document does not contain all possible interactions. Therefore, before using this product, tell your doctor or pharmacist of all the products you use. Keep a list of all your medications with you, and share the list with your doctor and pharmacist. NOTES: Do not share this medication with others. This medication has been prescribed for your current condition only. Do not use it later for another infection unless told to do so by your doctor. A different medication may be necessary in that case. Laboratory and/or medical tests may be performed periodically to monitor your progress or check for side effects. Consult your doctor for more details. MISSED DOSE: If you miss a dose, take it as soon as you remember. If it is near the time of the next dose, skip the missed dose and resume your usual dosing schedule. Do not double the dose to catch up. Do not take more than one dose per day. STORAGE: Store at room temperature at 77 degrees F (25 degrees C) away from light, moisture, and extreme heat. Brief storage between 59-86 degrees F (15-30 degrees C) is permitted. Do not store in the bathroom. Keep all medicines away from children and pets. Do not flush medications down the toilet or pour them into a drain unless instructed to do so. Properly discard this product when it is expired or no longer needed. Taking outdated tetracycline-related drugs can result in serious illness. Consult your pharmacist or local waste disposal company for more details about how to safely discard your product.